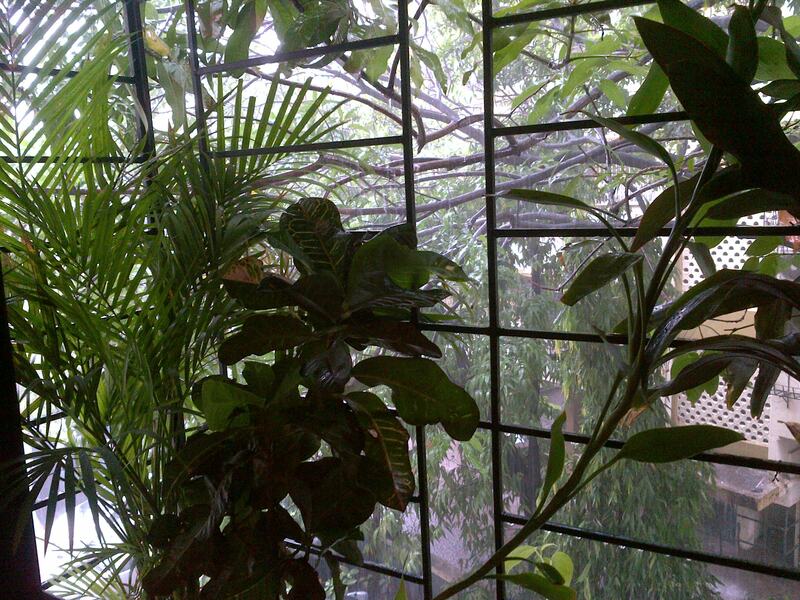 The monsoon has reached Mumbai and even after so many years here, the first rains bring a special joy! There is something about the monsoon. It is the difference between the economy flourishing or failing. It is the delight of dancing in the warm rain. Children playing, laughing with abandon, splashing about soaking wet. There is a different light in the sky, a different scent in the air, the feel of life pulsing strong, plants and trees take on a lush rich green hue, bursting with renewal. 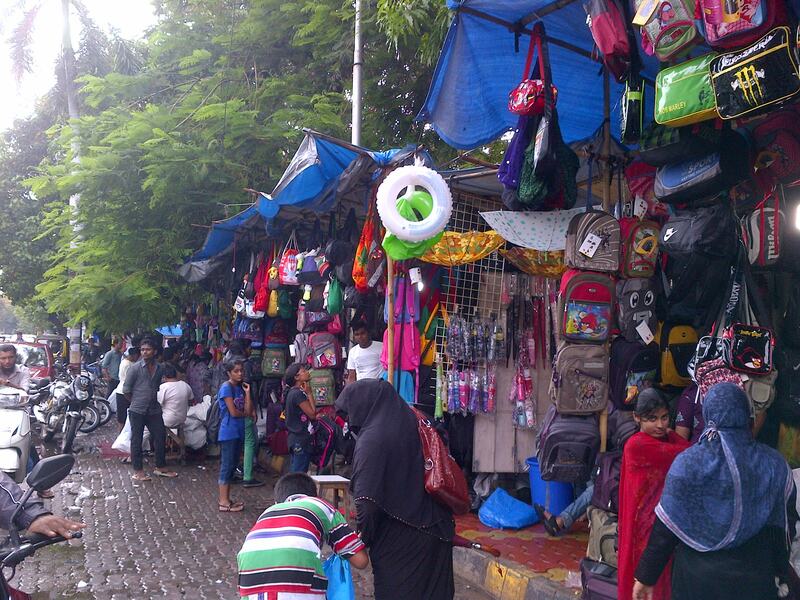 The signs of the coming monsoon have been visible for weeks with the ubiquitous blue tarp popping up all to offer a modicum of cover to the everyday life on the streets, stores and even hospital emergency entrances. 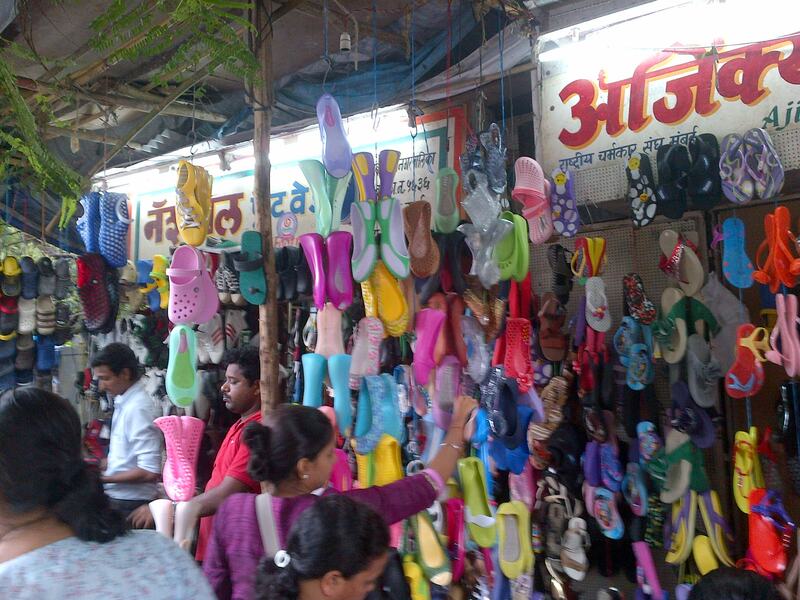 Roadside shops are filled with umbrellas, colourful plastic backpacks and the latest fashions in monsoon chappals (sandals). Thus prompted, I dug out my favourite monsoon footwear (aka flip flops) and flimsy umbrella, ready to venture forth knowing fully well I will be drenched the moment I step out regardless of precautions. And did I pay heed to any of these preparations when running errands this weekend? Nope! When the deluge came, I found myself in regular shoes not meant for puddles, missing an umbrella and trying in vain to find a rickshaw. Clearly I had company in being caught off guard – every year people and vehicles need a day or two to re-discover their monsoon tactics. For some reason, I not only found my predicament amusing but couldn’t help thinking of how it is essentially no different from the first serious snow in Canada. Drivers especially forget how to navigate icy or slushy roads with all that white stuff falling, somehow surprised by the an annual occurrence of winter weather that lasts, oh around 6-9 months each year. And just like in Manitoba, soon after the initial days of careening about, children enthusiastically playing for hours in the snow, refusing to come indoors from the cold, after a while winter becomes normal and just another day. Same here in Mumbai, where a mere inch or two of water today causes havoc… in a week, we will all be merrily trudging through a foot or more with aplomb. Rick stuck? No prob, we’ll hop out and push. The road has become a river? Easy! Keep revving the engine as you slowly plow through – just don’t stop and you’ll make it! Soon enough the city settles into the monsoon rhythm battling internet, cable and power cuts, clogged drains bringing diseases, wet clothes never dry and dry clothes become moist even tucked away in cupboards, mould forming on just about anything, companies functioning at half strength when trains slow or stop and staff can’t reach… yet still business and life carries on. No different than Manitoba where a mere blizzard at most shuts the city for a day, possibly with a record number of “blizzard baby” births 9 months later! So whether its Maharashtra or Manitoba, mother nature can smile benevolently or throw a temper tantrum. Life will go on, we all adjust and for now, I’m just going to enjoy the early rosy romance of monsoon… relax to the rhythmic pounding of the rain, maybe curl up with a good book and hot cup of tea. Yup – that sounds about the perfect way to welcome the monsoon to Mumbai! 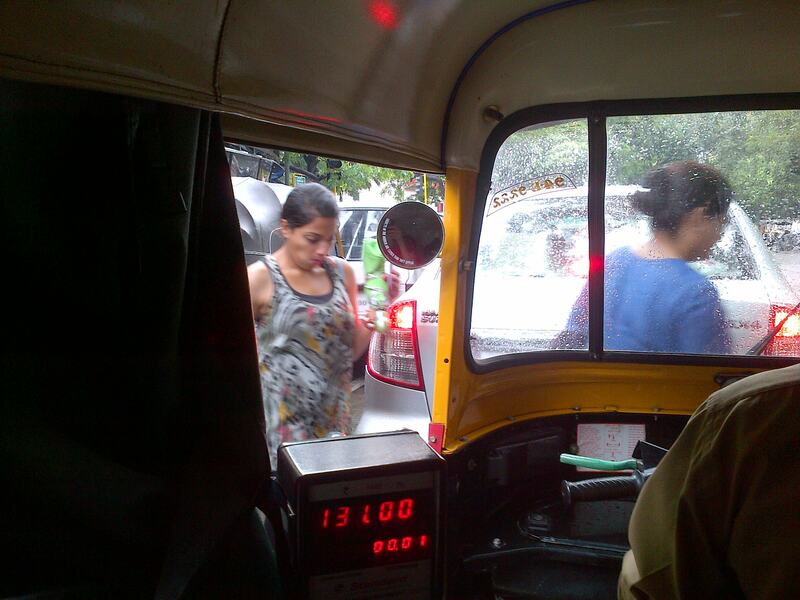 Are there any weather changes that entrance or frustrate you at first only to later become ‘hum ho’ everyday? By Carissa Hickling in Canada, Discovering difference, Every day, India on June 10, 2013 . Start of the cockroach season in May… not quite the same, but there are certain parallels. Who saw the first one in their house and where?? Big annual breakfast discussion. Then everybody goes stocks up their arsenals (powder, traps, sprays, industrial-scale fumigation, you name it) and we’re ready to fight. Until October, when it gets too cold for them. Never really thought of cockroaches having ‘seasons’ 🙂 Can’t stand them and while its a perennial problem here, so far quarterly pest control services with gel seems to work! Phew! Loved the post – humans are amazingly adaptable when it comes to weather and we all seem to respond on some level to the seasonal patterns. Folks here tease me about being ‘cold’ with A/Cs or anything less than 23’c. My response is generally along the lines of: “In Winnipeg you go from your heated home, to your heated car, to your heated office.” And “If you plan to spend time outdoors, you dress for it.” My favourite is comparing how Winnipeg is not so bad at -40’c as its a ‘dry cold’ just like Delhi at 49’c is a ‘dry heat’. Ok… they are both still bloody hot and bloody cold! And thanks again for taking the time and trouble to read & comment on my blog. Thank you for an interesting post. I hope you offer an explanation of how you ended up in Mumbai as opposed to any other place. I’m sure there’s an interesting story there. So I’m a language guy and I have to ask, do you speak Hindi or Marathi? Thanks for following my blog. I hope you continue to enjoy it! How I ended up in Mumbai is a bit of a long story which combines the personal and the professional. Quick synopsis is originally came to India for academia, then returned for a relationship, which lead to building an interesting career. After the relationship ended, remained for sheer enjoyment, with a fab job taking me across Asia! Now find myself in a remarkable new relationship which keeps me firmly anchored to Mumbai and am taking time to carefully build the next professional move. Let’s see what happens next! Just feel lucky and have no regrets.